1. The Yokohama Strawberry Festival begins today and will run through Monday, February 11th at the Red Brick Warehouse. This popular event draws strawberry lovers from near and far so if you want to score some good free sample get their early – opens at 11:00. There will be strawberry tasting, workshops and art projects for the kids. While in the area I recommend you visit some of our families favorites in Yokohama – CupNoodle Museum, Cosmo World Amusement Park, Overseas Migration Museum, Zoorasia, Kodomo no Kuni or the Anpanman Museum. Also visit the new Hamley`s Toy Store and Mark IS Shopping Mall. Chinese New Year Celebrations are also in effect so head over to Yokohama Chinatown for some early New Year energy. 3. Are you ready for Setsubun? It’s on Sunday, February 3rd. There are so many great festivals, crafts and art associated with Setsubun. Read about some of the best inspirational and educational bits we could find! S etsubun Celebrations – Three great places to see the best Tokyo Setsubun Celebrations on Sunday, February 3rd. 4. 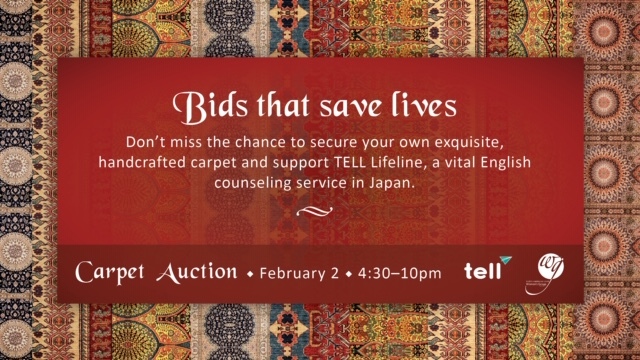 TELL & TAC Women’s Group Carpet Auction – Saturday, February 2, 2019 – A great opportunity to purchase a unique oriental carpet that can make that special statement in your home or office, while also doing something good for young people in the community at the same time! The hand-woven carpets at this year’s auction are exquisite collectibles from Iran, Afghanistan, Russia, Turkey, and India that are a not only a perfect reminder of your time in Japan but also make a wonderful addition to any room in a home or office. Better still, part of the proceeds will be donated to TELL and used to support our Chat Line and services for children and families struggling with mental illnesses in Japan. Come and join us and for a drink, good conversations, and stunning carpets. 5. O-Edo Antique Market (International Forum, Yurakucho) – Held twice a month; 1st and 3rd Sundays. Is said to be the largest outdoor Antique market in Japan. Super central and convenient for people who live in downtown Tokyo. This is one of my favourites. *** For more great markets this weekend visit our February 2019 Tokyo Area Antique and Flea Markets list. 6. Last month to go ice skating outside – Many outdoor skating rinks shut down for the season this month so this weekend is a great time to go skating before it is too late. Here are our top skating picks for the Tokyo-Kanto area. Bundle up and hit the ice!